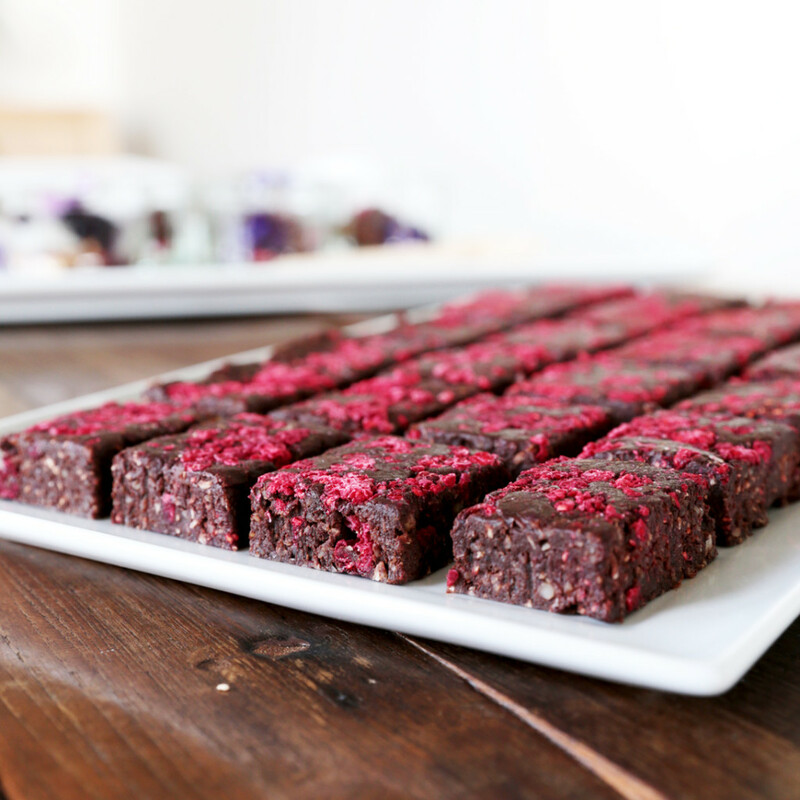 These chocolate and raspberry brownies are entirely raw, have a whole avocado hiding inside them, and are bursting with nutrients which, I think, makes them taste even more amazing! Made from a base of brazil nuts, which are a great source of selenium and magnesiu, and avocado, a good source of healthy fats, these brownies are packed with plant protein. Raw cacao powder provides the antioxidant rich chocolate hit, and dates provide the sweetness as well as dietary fibre and even more mineral goodness in the form of iron, potassium and magnesium. Raspberries add a lovely tartness to balance out the sweetness (although these brownies are definitely not as sweet as your standard baked chocolate brownie), and a little desiccated coconut adds to the flavour and texture. They’re very quick and easy to make, simply combine the ingredients in a food processor then press into a lined tray. Chill for 30 minutes before cutting into slices. Or if you’re feeling creative use a cookie cutter to cut into fun shapes! In honour of upcoming Valentine’s day I made these into hearts, and what better gift to give – a guilt free dessert that actually serves your health! Line a small brownie tray with a double layer of cling film. Place the brazil nuts in a food processor and blend until they resemble coarse breadcrumbs. Place the nuts into a bowl and set aside. Combine the chopped dates, avocado, cacao powder, maple syrup, sea salt and vanilla in the food processor and blend until you have a smooth chocolately paste (this tastes amazing!). Add the brazil nuts and coconut and pulse until just combined. Add the raspberries and pulse again until just combined. Press the brownie mixture evenly into your lined tray and place in the fridge to chill for half an hour. Once chilled, lift the brownie out of the tray and cut into desired shapes. Store in a sealed container in the fridge for up to 1 week. *freeze dried raspberries by ‘fresh as’ can be found in local food stores such as Farro, Nosh and some New worlds.